How was your Monday? Mine was much better than last Monday since I got enough zzzz’s. I had tons of meetings to go to today, so I had to be on top of my game. Breakfast was oats in a jar. I sprinkled in some cinnamon (two types of Penzey’s) and added 3/4 of a banana. I also topped my oats with some chocolate chips. 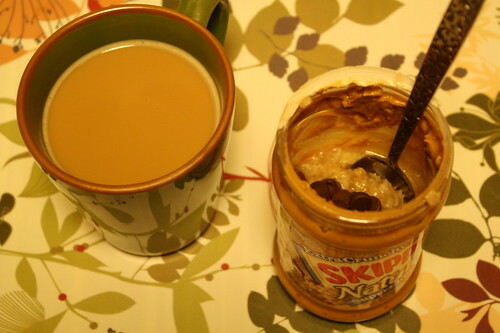 No snack at work today–didn’t need one after that bowl of oats kept me nice and full! 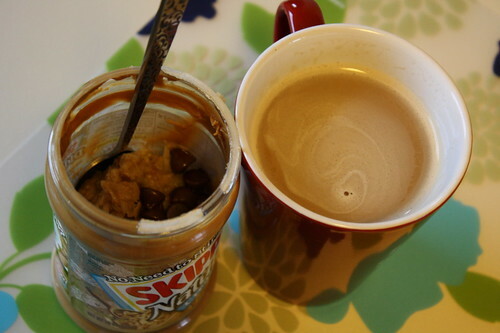 I just had a cup of instant coffee for an extra pick me up on a Monday morning. 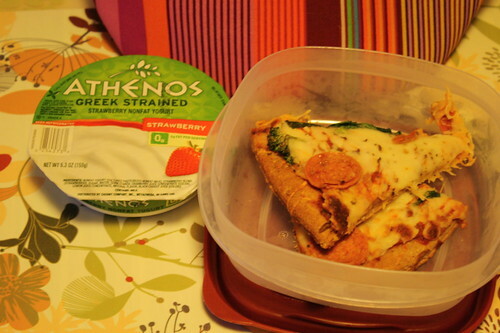 Lunch was leftover pizza (two slices), strawberry Athenos greek yogurt, and an unpictured pink lady apple. For dessert, I had havla, which my co-worker brought back from Israel. It was pretty good. Totally love trying new foods from other countries! 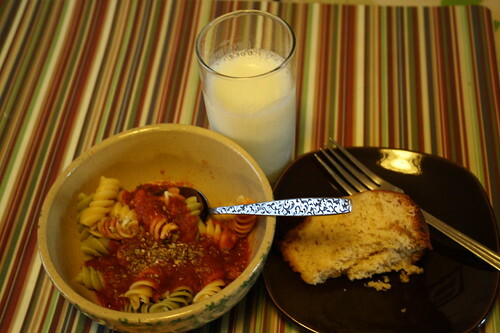 Dinner was the leftover pasta with tomato sauce and almond cake for dessert. I washed it all down with some skim milk. My workout tonight was good. The gym was quite packed, so I started with weights, then went on the Octane elliptical, and walked on the treadmill at a high incline. I checked March’s top fitlinxx members of the month board and was shocked to see the number of points the women got last month (my name didn’t show up on the list this time)! Some tough competition out there, but it motivates me to push myself so I can get back on that board another month! Time to catch up on my blog and book reading! 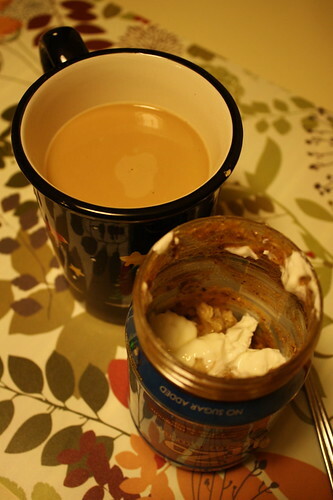 This morning, I got up, relaxed a bit, made oats in a jar and coffee and then got ready to go to my friend Angie’s house. 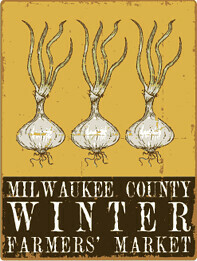 We headed over to the Milwaukee County Winter Farmer’s Market together at State Fair Park. It was a fun morning spent sampling all sorts of treats: dark chocolate caramel with sea salt, eggplant Parmesan soup (totally delicious), bread with balsamic vinaigrette, cookies, scones, bread, flaxseed crackers, feta/kalamata olive dip, sorghum syrup, granola, enchiladas, & strawberry preserves (tasted the difference between no sugar and sugar, I actually liked no sugar just as much). 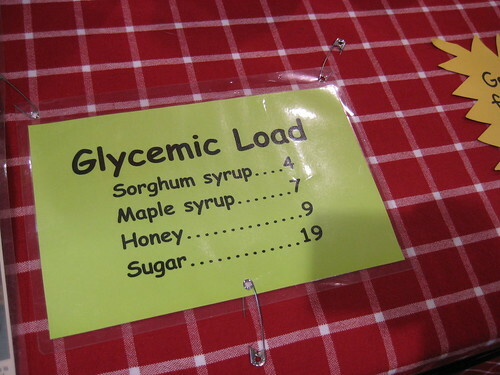 Well, no wonder I didn’t want to eat lunch later in the day! The samples were all very little of course. 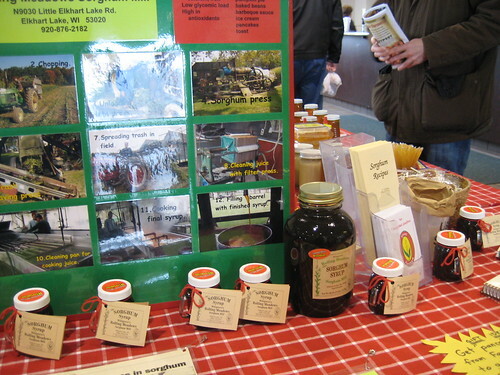 I can’t wait until the spring and summer markets open up, but this was fun to experience. 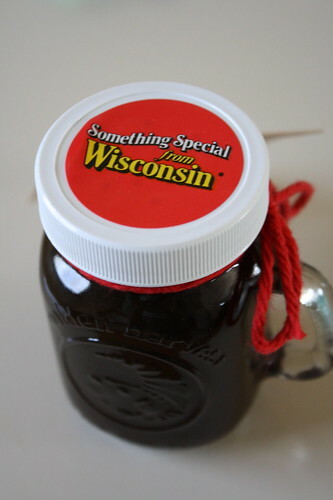 The only thing I purchased was sorghum syrup. I had never had it before or even heard of it. I sampled a bit before purchasing and think it tastes like molasses. 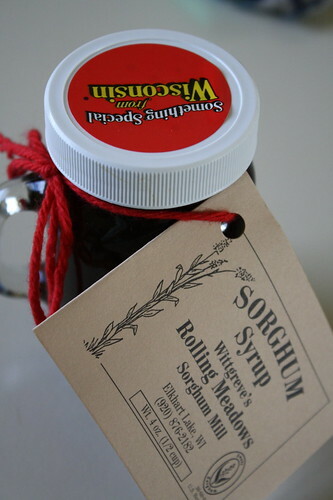 I grabbed a free sorghum recipes brochure and will try making something from that, maybe some cookies. Here is a sign the booth had posted which did influence me to buy it. After the market, I got a tour of Angie’s adorable house, we chatted for a bit and then I headed home. I thought Craig and I were going to get Indian buffet for lunch but after last night’s buffet and all of the samples I had at the market, we opted to save it for another weekend. I was in my “cleaning mood” as Craig calls it and I did more laundry, hand washed lingerie, brought some things into the basement, did dishes, etc. It felt good to clean up around the house! 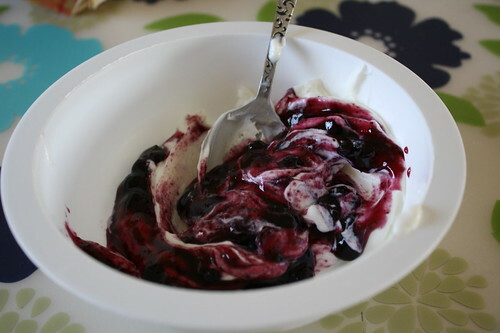 I finally had something for a late lunch–just plain chobani with the wild blueberry preserves. I rested on the couch and like always, conked out in a nap and so did Craig. By the time we woke up, it was 3:30. Aaah, naps are too common for me lately and then I feel so behind in my plans for the day. I got up, cleaned some more and ate an early dinner. 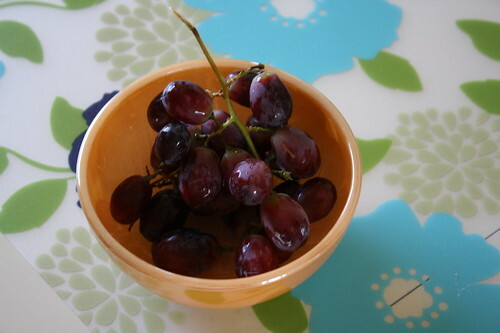 I had red grapes first. 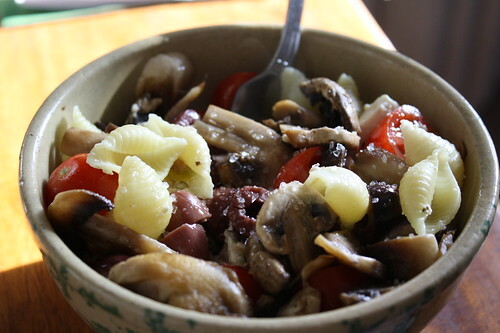 Then I made pasta with mushrooms, kalamata olives, feta and tomatoes–all drizzled with olive oil and topped with a bit of sea salt. 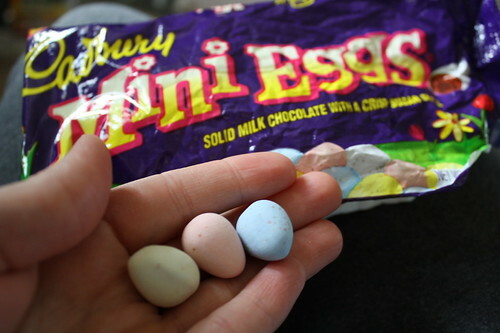 Dessert of cadbury mini eggs were calling my name. After meditating, Craig and I went on a walk around the neighborhood for about 20 minutes. I changed into my gym clothes when we got home and headed straight there, because it was getting late at this point in the day. I just wanted to do a light workout so I lifted a few weights and biked for a half hour while finishing reading a Fitness magazine and watching HGTV’s dream home show. 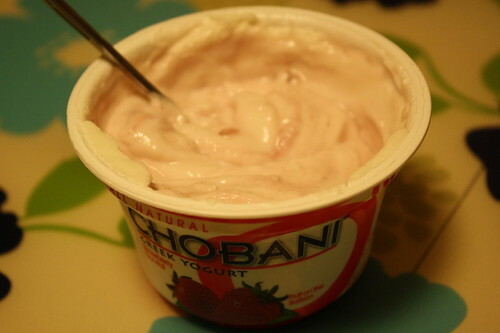 Once home, I needed some protein so I had a strawberry Chobani yogurt. Time to log off and watch Despicable Me! Tomorrow, I am headed to brunch with the girls and then to my parent’s house after to visit and drop off/pick up some things. Anyone else ready for a mini Christmas vacation? I am ready for our vacation in Florida, but I have to wait another month and a half for that. Gee, we better get our flights, rental car and hotel booked soon! Anyone have any recommendations of where to eat and stay in the Orlando area? 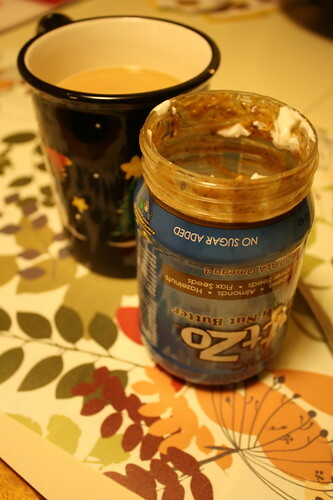 My breakfast consisted of the blog world’s famous “oats in a jar.” I don’t know who started it, but they are a genius. 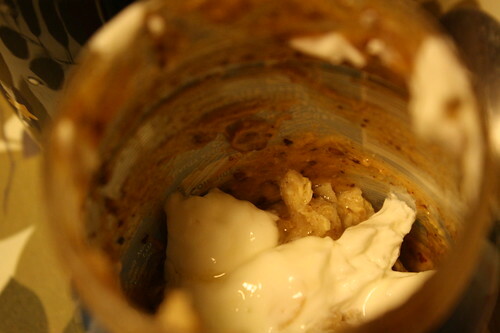 I took a container of NuttZo that only had about an inch left of nut butter left and put stovetop oats into it. I also added some honey and greek yogurt to sweeten and add protein. No dishes to wash, just a container to recycle. This would be perfect to take to work, as long as you don’t mind a cooler bowl of oats. Obviously, I would highly recommend trying the oats in a jar idea. 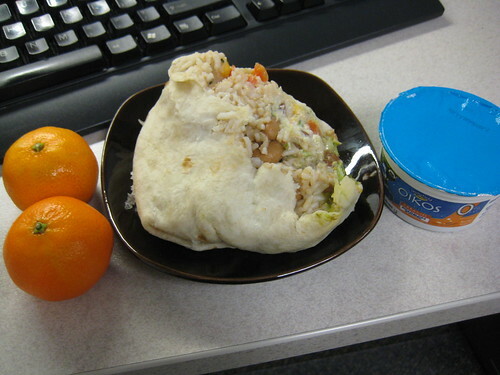 Lunch was leftover Qdoba (veggies burrito), the last Oikos caramel yogurt, clementines and some chocolate–a Kinder Bueno to be specific. I am surrounded by chocolate at the office. Not just any chocolate, but German chocolate! 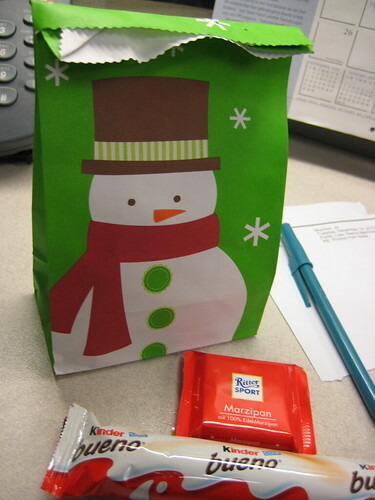 My former co-worker (who is German and now lives there again) sent our office a nice package of treats to munch on before the holidays–thank god for her. Alas, I resisted the chocolate until lunch today. I also couldn’t resist the temptation of Haribo Frogs. For some reason, they seem to be softer from Germany. I particpated in my third Zumba class tonight. It was challenging in the middle of the class. There were new dance moves and songs and I couldn’t catch onto the moves. I laughed with another girl in front of me and admitted out loud that I was lost. After class, I lifted weights for my legs. I haven’t been in the workout room in a while to go on machines or the weights. It’s been all classes lately and I miss the workout room. 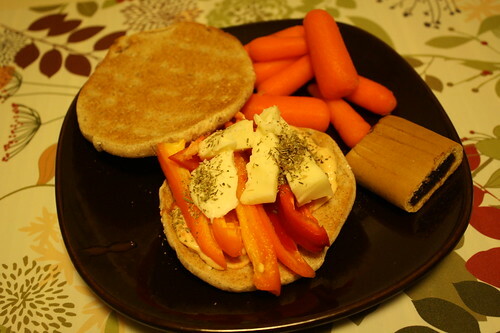 Dinner was an Arnold Thin with sweet peppers, brie, chipolte mayo and oregano. It tasted yummy! I also had some carrots on the side and a Fig Newman. Like many of the Newman’s Own Organics products, these tasted like Fig Newtons, only less sweet. I have more energy tonight and will not fall asleep on the couch! Time to use that energy to wash dishes and pick up around the house. Night!